Eastern senior Alexus Metheney delivers a serve, during the Lady Eagles’ victory over Wahama on Monday in Tuppers Plains, Ohio. Wahama’s Hannah Billups (11) hits the ball over the net, during Monday’s TVC Hocking volleyball match in Tuppers Plains, Ohio. TUPPERS PLAINS, Ohio — The Lady Eagles completed step one to their plan for a strong finish. 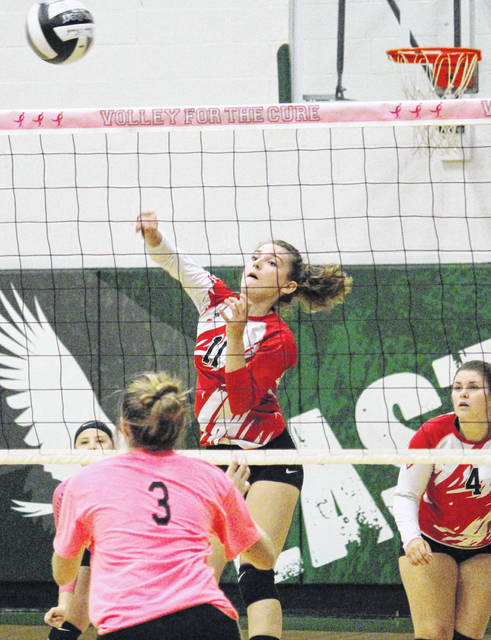 The Eastern volleyball team started the final week of the season in style on Monday at ‘The Nest’, claiming a straight games victory over Tri-Valley Conference Hocking Division guest Wahama. Eastern (14-5, 12-2 TVC Hocking) never trailed in the opening game, fighting through a a pair of ties on the way to a 25-20 win. 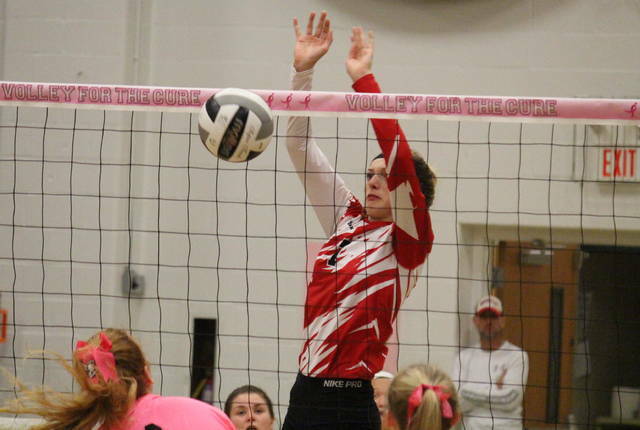 Wahama (2-13, 2-13) took its first lead of the night at 6-4 in the second game, but the Lady Eagles scored the next four points, fought through a tie at 8-8, and led the rest of the way to the 25-18 victory. The hosts claimed the first four points of the third game, but the Lady Falcons battled back to take the advantage at 6-5. EHS took the lead back with three straight points, and never trailed again on its way to the match-sealing 25-15 victory. 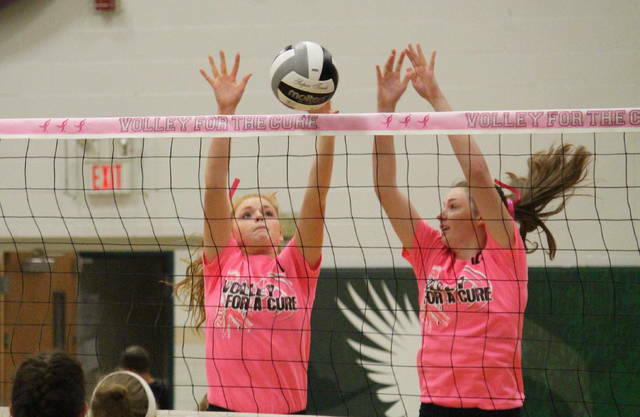 Following the win, Eastern head coach Mykala Sheppard talked about what the win meant to her team, not only to start the final week of the year, but also on the team’s Volley for the Cure night. Even with the straight games win, Sheppard acknowledged her team is still making too many errors on the court. For the Lady Falcons, head coach Matt VanMeter noted that his team’s focus might have been elsewhere. Coach VanMeter also talked what the future may hold if and when the Lady Falcons do put it all together. For the match, Eastern finished with a 58.7 side-out percentage, while Wahama’s was 38.4. The Lady Eagles had 11 aces and a 90.4 serve percentage, while the guests finished with four aces and a 93.7 serve percentage. 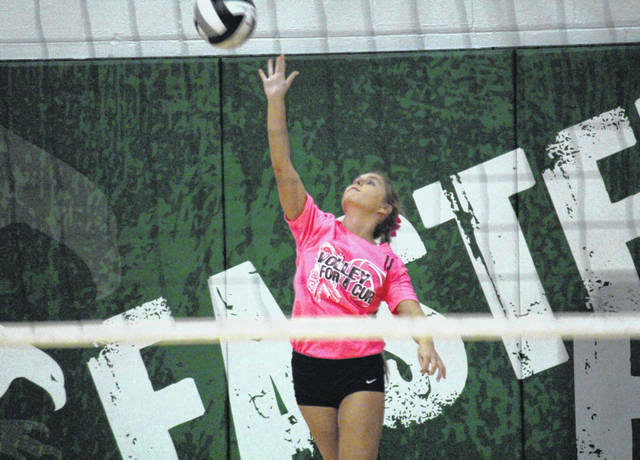 EHS senior Kelsey Casto led the Lady Eagles with 19 service points, including a match-best six aces. Jenna Chadwell earned nine points and an ace, while Caterina Miecchi and Alexus Metheney finished with six and five points respectively, with a pair of aces each. Kylie Gheen and Allison Barber earned one service point apiece in the victory. Harley Roush and Alexis Mick led Wahama with seven points apiece, including two aces by Mick and one by Roush. Hannah Billups and Bailee Bumgarner had four points apiece, with Billups earning an ace, while Gracie VanMeter and Logan Eades earned one point each in the setback. Miecchi led the Lady Eagles at the net with 13 kills and a block. Layna Catlett was next with eight kills and a block, followed by Allison Barber with six kills. Chadwell had three kills and a match-best 19 assists, Olivia Barber earned three kills of her own, while Gheen picked up a kill in the win. Allison Barber led the EHS defense with 13 of the team’s 51 digs. Billups led the Lady Falcons with four kills, followed by Gibbs with three kills and a block. Roush finished with a pair of kills, Logan Eades had a kill and a block, while Gracie VanMeter earned one kill and a team-best four assists. Eastern also defeated the Lady Falcons on Sept. 17 in Mason, by a 3-1 tally. After hosting Trimble on Tuesday, Eastern will be back on the court at Waterford on Thursday. After visiting Southern on Tuesday, the Lady Falcons have a week off before traveling to Point Pleasant.